Hands, arm and above-the-knee and below the knee limbs including specialty prostheses for running, swimming and activities including hunting and fishing. Recreational activity offers a variety of benefits and helps to keep all other lifestyle activities in balance. Following amputation, many aspects of your life will change and require you to make some adjustments in order to participate in recreational activity. The focus of Therapeutic Recreation is to assist a person in the return to preferred leisure activities after an amputation using adaptive equipment, increasing leisure skills and expanding knowledge of recreational resources. 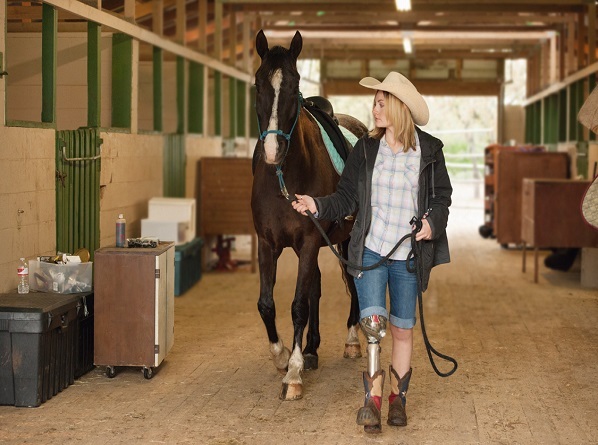 Depending on the type of amputation and the specific leisure activity you would like to return to, there are a variety of adaptive equipment options available. A Therapeutic Recreation Specialist can direct you towards the appropriate adaptive recreation equipment to increase your functional ability without hindering your enjoyment of the activity. He or she can answer any questions regarding purchasing and utilization of the appropriate equipment selected. Some people find it difficult to identify past leisure activities they are interested in. A Recreational Therapist can assess your current lifestyle and assist in making changes to incorporate leisure activity for a healthy, well-balanced lifestyle. This can include learning new leisure skills that carry over into everyday life. Immediately following amputation surgery, the body is in a weakened state. Before long, most people are able to walk with a below-knee prosthesis and perform many of the daily activities that they enjoyed before amputation. By exercising with or without your prosthesis, you can continue to reach new goals, become more' active, and maintain a healthy lifestyle. People with amputation have run across the United States, climbed Mount Everest, and competed in various events in the Paralympics. With their state-of-the-art prostheses, record- setting performances, and shining perseverance, these athletes are an inspiration to us all. As you get ready to have your first prosthesis made, you may have many activities in mind that you would like to take part in with your new leg. Be honest with your rehabilitation team about these goals. This will help them to find the best design for your artificial limb. If a particular activity is a very important part of your life, you may even choose to purchase a second prosthesis just for that activity. Most insurance companies will not provide funding for a secondary prosthesis, however, so speak with your prosthetist about your options. The following are just a few activities that you might want to take part in. The information is meant to help you choose an appropriate prosthesis and modify your technique for greater safety and enjoyment. Whenever you begin a new activity, start slow and build your endurance gradually. Being too aggressive with a new sport puts you at risk for developing a sore on your residual limb or even a more serious injury. Golfing is a relatively low-impact activity that challenges a person's balance and form. Proper balance for someone with amputation will improve over time as he or she becomes accustomed to using a prosthesis. Many people with amputation use their everyday prostheses to play golf, although there is an additional component that can make your prosthesis more appropriate for golf. The tibial rotator allows the prosthetic leg to rotate while the foot remains planted. The leg will then return to the forward position when the body is relaxed. This not only makes a golfer's swing feel more natural, but also reduces the possibility of skin abrasion within the prosthetic socket. Your prosthesis was designed for walking; challenging terrain and scenic surroundings can make this activity even more enjoyable. Although hiking is relatively low-impact, the issues of stability and comfort should be addressed. Stability over uneven ground can be increased through use of a multi-axial foot. The multi-axial foot is able to tilt and rotate over uneven ground without forcing the rest of the limb to also tilt and rotate. The issue of comfort is addressed through design of the socket and choice of the foot. A well-fitting socket and strong suspension such as silicone suction or an external knee sleeve should prevent injury to the residual limb. A dynamic response foot may also add to your comfort. Before beginning to hike, you should be able to walk long distances with your prosthesis without forming blisters. Discontinue hiking if blisters do form and have your prosthetist check the fit of your artificial leg. Running is an efficient way to achieve aerobic conditioning, although it places great stress on the residual limb. Be sure to consult your physician before beginning a running exercise program. A high-performance running prosthesis can be very expensive, but will allow you to run or jog most efficiently. Just as with your basic walking prosthesis, socket design is the most critical to comfort and performance. The most common problem for below-knee amputee runners is skin breakdown over the lower front region of the residual limb. If running or jogging causes any pain or irritation, especially in this region, notify your prosthetist so you can discuss socket changes. Strong suspension, such as silicone suction or external knee sleeve, will make the limb feel lighter and more comfortable as well. The below-knee running prosthesis should be as lightweight as possible. This means that care must be exercised when choosing the pylon and foot for the limb. While a vertical shock pylon helps to lessen the impact on the residual limb and knee, the added weight may actually make running more difficult. An energy storing foot designed for running will weigh less and provide some active push-off. Sprinters often run only with the front of the foot, so many sprinting feet will not have any heel or ankle. Finally, your prosthetist should be able to align your running leg so that the correct portion of the foot makes contact with the ground. This will add to your comfort and help you to run more efficiently. Swimming is a great activity for people with amputation because it exercises the muscles and improves endurance without injuring the sensitive tissues of the residual limb. Unfortunately, the average below-knee prosthesis does not allow you to simply jump into the swimming pool and start paddling. Most below-knee amputees swim without a prosthesis and do very well. Other people choose to buy a secondary limb that is made especially for swimming. Most swim legs have a hollow plastic shell with holes that let water in while you swim and drain the water once you are finished. This prevents the leg from simply floating on the water's surface as you attempt to swim. The limb is suspended with a waterproof external sleeve, which prevents water from getting between your limb and the socket. Some swim legs are made with an ankle joint so that the foot can be locked with the toes pointed. This gives you a more powerful kick. If you plan to use your swim prosthesis at the beach, a cover for the ankle unit will keep the sand out. Sometimes an old prosthesis can be converted into a swim leg for considerably less money than buying a new swimming prosthesis. Talk to your prosthetist about your options. Cycling exercises the residual limb in a smooth, repetitive manner that does not require the limb to bear the body's weight. This strengthens the muscles and improves endurance without injuring the residual limb. Some sockets limit the amount that your knee can bend, making it difficult for your prosthetic leg to reach the top position while pedaling. You have two options to fix this problem. You can modify your bicycle by using a shorter crank on the prosthetic side; this reduces the amount that you must bend your knee to reach the pedal. The second option is to lower the back edge of your socket to allow your knee to bend further. Unfortunately, this modification may make your prosthesis less appropriate for walking. If you do choose to have the back edge of your socket lowered, another solution is to convert an old prosthesis into a cycling leg. Some people will suggest raising the bicycle seat so that your leg does not have to bend as much, but this is generally not a good idea. Raising the seat will only cause discomfort as you strain to reach the pedals by rocking back and forth in your seat. Many amputee cyclists find that their prosthetic foot falls off the pedal while cycling. The safest solution is to place the heel of your prosthetic foot rather than the front of the foot on the pedal and to use serrated metal pedals and a shoe with a good tread. You can also try putting Velcro between your shoe and pedal to keep your foot in place. It is recommended that only experienced riders consider using toe clips to hold the prosthetic foot in place, as serious injury may result if you cannot release your foot quickly in an emergency.